3 Fun Thanksgiving Snack/Craft Ideas For Kids - I Don't Have Time For That! Families who have children know they have little tummies. Since they can’t hold as much food as an adult, they may need to eat snacks to keep them going through out the day. As the holidays near, considers these fun Thanksgiving snack ideas. In fact your children can help you prepare these snacks the day before Thanksgiving so they’ll be available for guests until the meal is ready to eat. Combine the sugar, butter and vanilla until it is smooth and easy to spread. If the frosting is too thick, you can add a little bit of milk to help thin it out. Lightly ice the outside of the cones and place them upside down on a cookie sheet. Put them in the freezer for a little while to give the icing a chance to harden. When the cones come out of the freezer, draw line patterns and American Indian motifs on them with tube decorating icing. Use the icing to glue candies onto the tepee. Place three toothpicks in the top of the cone to look like the lodge poles. Have the children remove the toothpicks before they try to eat their tepee snack. Acorns are a common item found around Thanksgiving but you probably don’t want your child picking up acorns and putting them in their mouth. Here is a way they can do just that! You’ll need donut holes, chocolate frosting or peanut butter (if your child isn’t allergic to it), crumbled toffee or sprinkle and broken pieces of pretzel. Begin by putting frosting on the top third of a donut hole. 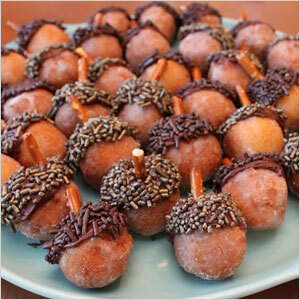 This can be done with peanut butter or chocolate frosting to give the look of the cap of the acorn. Carefully roll the frosted top into crumbled toffee/sprinkles. Finish it off by placing a small piece of broken pretzel into the frosting to act as a stem. Your child can help make an ice cream cone cornucopia which can be both a fun Thanksgiving snack and a table decoration. These are very simple to do. Spoon a little bit of frosting into a sugar cone. Then your child can place M&Ms, pretzel sticks, nuts, raisins or other small snack items into the cone.Put out tubes of decorating gel and let each child decorate his or her own cornucopia. Let the goodies spill out of the cone to signify having plenty. These three fun Thanksgiving snack ideas are so easy to make that the children in your family can do most of the work all by themselves. If you think about other common Thanksgiving items, you may be able to come up with snack ideas for those as well. Your children will love helping to make these fun snacks but they’ll enjoy eating them even more.